Well I was thinking a Little lately and figured I would get a opinion on one of the new fairy monsters coming out in Shinning Darkness. 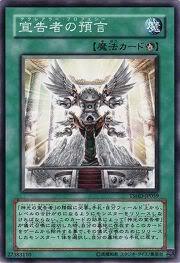 This card can only be Ritual Summoned with the Ritual Spell Card, "Herald Promise". You can send 1 Fairy-Type monster from your hand to the Graveyard to negate the activation of a Spell Card, Trap Card, or Effect Monster's effect and destroy it. This card is used to Ritual Summon "Perfect Herald". You must also Tribute monsters whose total level equals 6 from the field or your hand. When "Perfect Herald" is Summoned by the effect of this card, you can remove from play this card in your Graveyard to select 1 of the monsters used as a Tribute for the Ritual Summon, and add it from your Graveyard to your hand. Aside from a mediocre attack power...the effect is amazing. 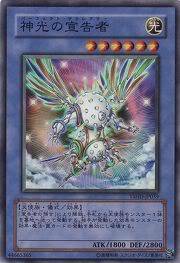 If you could couple that with the effect of Krystia and Counter fairys..the control you could achieve on the field would be pretty ridiculous. The only thing you would have to maintain is fairy's in your hand...but that can't be overly hard to do..where as you can let counter traps do the brunt of the work and herald can be a 2nd line of defense to prevent your opponent from doing anything. The only key would be in heralds case..is using his effect for a one for one type trade off. if you can simply have enough fairy's to counter a equal amount of cards your opponent has ( thats not including counter traps you have ), Then you can effectively prevent your opponent from doing anything. The only issue I find with the card is how to fit the ritual portion into the deck as so it don't slow down the already rather slow counter fairy type deck. Unless you simply don't do counter fairy's and go a different route. Who knows..
when i look at this card, I think is the effect multitrigger? Way i see it. They would simply leave him in Defense ( 2800 def ), and leave him there as a permanent counter trap to support more less. He gets a instant use as well seeing as how you can return one of the monsters you use for his summoning from the graveyard once you get him out. Frankly, IMO; If you can simply get him on the field in DEF to slow down your opponent. It will be a great assistance...more so fill the grave with a adequate amount of fairys to special summon krystia. Generally with counter fairys..a majority of the monsters are weak..aside from special summoning a vandy or voltanis...the deck requires you to control the field and slow down the opponent until you can go on the offensive. One way of looking at it...Herald is a LADD for fairys that doesn't expire; long as you can discard fairys. Then you could simply pot of avarice and +1 and recharge your hand for more counters. Mind you...this is only Herald your speaking of ATM and you STILL got counter traps to fall back on. So you essentially got counter traps and your own monsters as counters. Calculate that out...you will run roughly..18 ish monsters? I would say maybe..14 or so of those are viable discards for Herald..so thats 14 equivalents to dark bribe/divine wraith at your disposal. then a counter fiary deck runs roughly 15+ counter traps....so take that a step further and total that out from counter traps + heralds effect. Generally Power is the problem with fairies..as..unless you use the higher level fairies..which end up somewhat situational (outside krystia ), you usually have to depend on some kind of defense to protect you. Solidarity is an idea...but it would depend how you use the deck. Using pure fairy isn't always the best optiona afterall. Counter Fairy's usually will mix vandy in somewhere, and or add other cards to add power or draw power. Krystia control decks are about the same and will mix a few misc. cards in for support. Fairies are getting a few new cards in Duel Terminal; Is a archetype that is slightly based around equip cards and has 2 synchros to it which are not all that bad.well they would go along with existing fiary builds I'm unsure...because the general opinion on equip cards is...to avoid them. The archetype is named Vairon.